Who doesn't love Tina Fey? 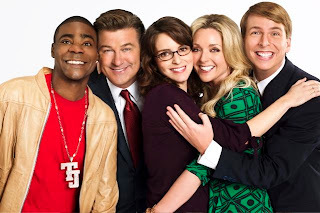 30 Rock is the funniest sitcom I've seen in a long time. It's not just the actors. It begins from the script. And for that, I heart Tina Fey. Sigh. And the cast. Oh, I love the cast so much. Tina Fey is so cute when she does her thing. And she loves Star Wars. How cool is that. Alec Baldwin is delightful. It doesn't seem like he's acting at all. Jane Krakowski's acting too, is effortless. Makes me think if she's really a bimbo in real life. Jack McBrayer too. Not about being a bimbo, but about acting effortlessly. And finally, the cherry on top of the show: Tracy Morgan. All hail Tracy Morgan. Tracy Morgan is like NPH in HIMYM (Neil Patrick Harris in How I Met Your Mother): a quotation gold mine. Only Tracy Morgan's quotes are more---hip. But that's because he's African-American. How stereotypical of me. 30 Rock captures the reality of the American entertainment industry, and even the cinematography and the hand-held camera movements come into play. It's not like the traditional sitcoms shot in a studio in front of a live audience. It's shot like a movie, more like an HBO show (but this one is produced by NBC, also the same network in the show). Expect a lot of cameos from celebrities who play...themselves. You can expect it to be a riot. And that's what this show is. One big riot, although cinematically subdued. And finally, I would like to end this post with a prayer. Dear God, I want to marry someone like Tina Fey. Amen. 30 Rock (Season One). USA. 2006-2007. "I was the editor of the school newspaper and in drama club and choir, so I was not a popular girl in the traditional sense, but I think I was known for being relatively scathing.” I heart Tina, too. "I was the editor of the school newspaper and in drama club and choir, so I was not a popular girl in the traditional sense, but I think I was known for being relatively scathing.” - I heart Tina, too. you're sure you didn't give a 10 because of tina fey? :P hehe. if you're questoning the ten-star rating i gave it, then you most probably haven't seen the show. haha. but i really, really, really heart tina fey. no, i haven't, but it's understandable if you did give it a 10 because of tina fey. :P hehe.